Libratus, an AI developed by Carnegie Mellon University, has defeated four of the world’s best professional poker players in a marathon 120,000 hands of Heads-up, No-Limit Texas Hold’em poker played over 20 days, CMU announced today (Jan. 31) — joining Deep Blue (for chess), Watson, and Alpha Go as major milestones in AI. This new AI milestone has implications for any realm in which information is incomplete and opponents sow misinformation, said Frank Pfenning, head of the Computer Science Department in CMU’s School of Computer Science. Business negotiation, military strategy, cybersecurity, and medical treatment planning could all benefit from automated decision-making using a Libratus-like AI. So how was Libratus was able to improve day to day during the competition? It turns out it was the pros themselves who taught Libratus about its weaknesses. “After play ended each day, a meta-algorithm analyzed what holes the pros had identified and exploited in Libratus’ strategy,” Sandholm explained. “It then prioritized the holes and algorithmically patched the top three using the supercomputer each night. Sandholm also said that Libratus’ end-game strategy was a major advance. “The end-game solver has a perfect analysis of the cards,” he said. It was able to update its strategy for each hand in a way that ensured any late changes would only improve the strategy. Over the course of the competition, the pros responded by making more aggressive moves early in the hand, no doubt to avoid playing in the deep waters of the endgame where the AI had an advantage, he added. Libratus’ victory was made possible by the Pittsburgh Supercomputing Center’s Bridges computer. Libratus recruited the raw power of approximately 600 of Bridges’ 846 compute nodes. Bridges’ total speed is 1.35 petaflops, about 7,250 times as fast as a high-end laptop, and its memory is 274 terabytes, about 17,500 as much as you’d get in that laptop. This computing power gave Libratus the ability to play four of the best Texas Hold’em players in the world at once and beat them. “CMU played a pivotal role in developing both computer chess, which eventually beat the human world champion, and Watson, the AI that beat top human Jeopardy! competitors,” Pfenning said. 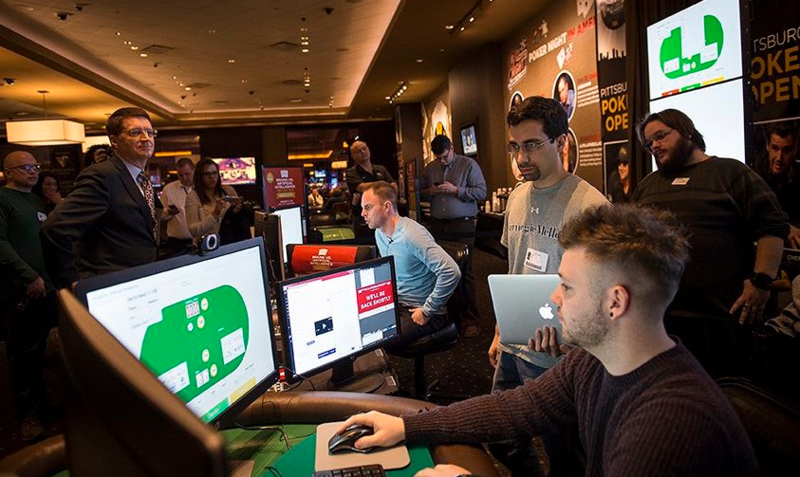 “It has been very exciting to watch the progress of poker-playing programs that have finally surpassed the best human players. Each one of these accomplishments represents a major milestone in our understanding of intelligence. Head’s-Up No-Limit Texas Hold’em is a complex game, with 10160 (the number 1 followed by 160 zeroes) information sets — each set being characterized by the path of play in the hand as perceived by the player whose turn it is. The AI must make decisions without knowing all of the cards in play, while trying to sniff out bluffing by its opponent. As “no-limit” suggests, players may bet or raise any amount up to all of their chips. Sandholm will be sharing Libratus’ secrets now that the competition is over, beginning with invited talks at the Association for the Advancement of Artificial Intelligence meeting Feb. 4–9 in San Francisco and in submissions to peer-reviewed scientific conferences and journals. * The pros — Dong Kim, Jimmy Chou, Daniel McAulay and Jason Les — will split a $200,000 prize purse based on their respective performances during the event. McAulay, of Scotland, said Libratus was a tougher opponent than he expected, but it was exciting to play against it. “Whenever you play a top player at poker, you learn from it,” he said. 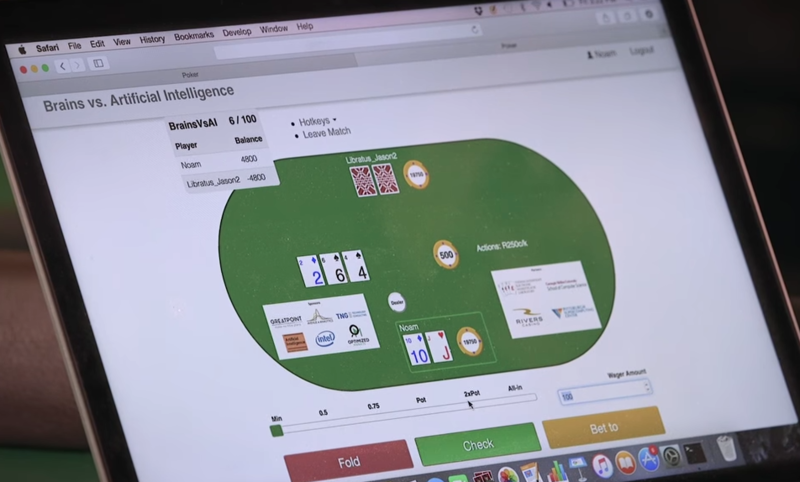 Carnegie Mellon University | Brains Vs. AI Rematch: Why Poker?